NEW YORK (AP) — Mirza Teletovic scored 24 of his 34 points in the second quarter and Deron Wiliams had 18 points and 11 assists as the Brooklyn Nets beat the Dallas Mavericks 107-106 Friday night for their fourth straight win. The Nets improved to an NBA best 9-1 in January. Paul Pierce had 12 points and Kevin Garnett added 10 points and 11 rebounds for New Jersey. Former Net Vince Carter had 19 points and Dirk Nowitzki added 18 points for the Mavs, who lost their second straight game. Brooklyn led by 11 in the fourth quarter on a basket by Teletovic, and then Dallas went on a late charge. 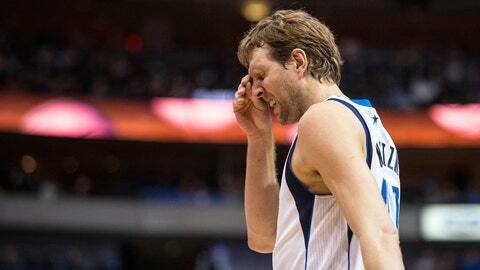 Shawn Marion made two free throws to close within 103-102. Andrei Kirilenko hit a free throw to increase the Nets’ lead to 107-103 with 5.3 remaining. Dallas’ Monta Ellis hit a 3-pointer to complete the scoring. Teletovic and Williams got it going for the Nets in the second quarter after they trailed 28-21. The reserve forward Teletovic tied it 23-all with the first of six 3-pointers he made in the period. He scored 19 of the Nets 23 points in the first six minutes to give them a 41-33 lead with 5:51 left. For Williams, it was his third straight game off the bench since returning to the Nets from a left sprained ankle. He had only one turnover in 35 minutes.